This is Buck's attempt to give us a USA MADE SOG SEAL PUP. The specs and design are very similar. The Sentry is best suited for Utility/Tactical use. It is not the best Survival/Wilderness. As of right now in 2013, they only come with serrations. The 420HC that Buck uses holds its edge well and is easy to resharpen. The sheath is a little big and noisy for the knife but works well. All in All a Jack of all trades master of none. 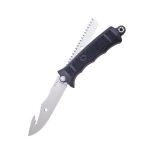 This knife is best suited for soldiers or your bug out bag not for camping, survival, and bushcraft. I would take a plain edge SOG SEAL PUP over the Buck SENTRY for camping, survival, bushcraft. 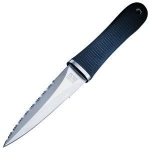 If I was picking a blade for Tactical/Utility then the SENTRY is just as good as the SEAL PUP.